Hey, here's a campaign that is basically an adaption of The Fall of Dundinborough. I've recreated the campaign with custom abilities, cards, tokens, and even a sound-player thing! It's pretty neat. This is, of course COMPLETELY UNOFFICIAL. I was just running something similar for my group of players, and thought, "why not?" The campaign is pretty loosely put together. As in the show, there are 4 combat encounters that can basically be played in any order you feel would work as the GM. You can have them encounter the Gold Golem before the Skelephelk, or have the Tournament in the King's Hall occur last. It's up to you. What isn't is the ending: at the end, no matter what, they're gonna be face-to-face with Bopen, the Skeleton King, alongside a bunch of Ageless. It was a ton of fun to both watch and play through with my group, so I hope you enjoy. 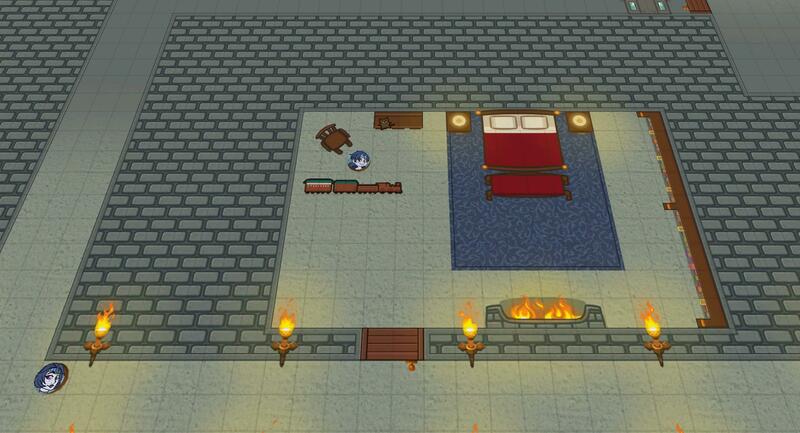 While it is an updated version, it also includes new mechanics and new directions for a few of the fights. The campaign is pretty loosely put together in which a group of Royal Guards witness the last days of the Shale Empire. As in the show, there are 4 combat encounters that can basically be played in any order you feel would work as the GM. You can have them encounter the Gold Golem before the Skelephelk, or have the Tournament in the King's Hall occur last. It's up to you. What isn't is up to you: at the end, no matter what, they're gonna be face-to-face with Bopen, the Skeleton King, alongside a bunch of Ageless. It was a ton of fun to both watch and play through with my group, so I hope you enjoy. 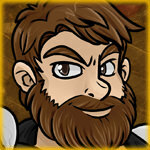 The races should be Dwarven - meaning Dwarf, Dvergr, and maybe Dwelf. Anything else might not work, but it is up to you. Remember that they will be protecting a Dwarven King. Classes should definitely not include the evil ones, like Bonedancer or Deathknight, but the rest is up to you. I personally used the paladin, suncleric, templar, monk, seeker, and thane. This is a short paragraph you can read or adapt into your introduction once you are done with Character Creation. "You and your party are a group of elite Royal Guards who are very well respected by the Shale family. Your job is twofold: protect the Royal Family, and train new guards. Currently, you are tasked with protecting Prince Phineas Shale, the next-in-line to the throne. Even more specifically, you are tasked with putting him to bed." The first encounter of this campaign is an RP encounter, in which the players are tasked with putting Phineas Shale to bed. This could mean anything from using siesta to reading him a bedtime story - let them be creative. Give them ten to fifteen minutes to put him to bed, and if you feel like they would have been able to, let him sleep. If not, have Queen Karolime Shale (positioned in the hallway outside of Phineas's room) come in and read him the story of Bopen, putting him to sleep. Prince Phineas Shale, next in line to the throne, is a somewhat young boy, around the relative age of 21. However, he still behaves like a small boy - whining when he doesn't get what he wants and forcing the players, his guards, to do his bidding. 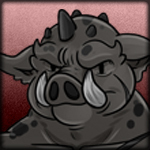 He will accompany the players throughout the campaign, and will often charge into battle headfirst. However, his combat prowess, even with his Enchanted Golden Cutlass, is very unhelpful most of the time. Phineas should be in trouble a lot, and it should be the party's goal to protect him. If they do well, there is a deck of useless Accessories that you can give them as a reward (found at the bottom of the table in the mod). If the party is unsuccessful in protecting Phineas, and he gets severely injured or dies, the later encounters will play out very differently. 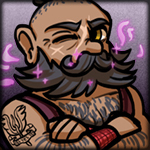 Deathroll: 1 (will almost never surrender and is hard to kill. if the party is far away from Phineas or he is in an extremely dangerous situation, bump this up to 5 or 10 as you see fit). divinityslash (Use whenever Phineas attacks. Say it is a basic attack and only deal 1 damage on anything less than 15, and anything more than that, cause a death roll that only kills the thing on a 1. Phineas can kill something potentially, causing hilarity. You just don't want it to be a frequent occurence). Once this is over, say that a day passes and move on to the next encounter. Although you can go in any order you please, I recommend saying that a day or so passes between each encounter. If you decide to let them enter the King's hall, and stand beside his throne to guard him and his family. Move Karolime and Phineas to their respective seats. Here, Virgo Sunblade and King Shale are in talks about the Ironstone Accords. You don't need to make much clear to the players, but try to convey that King Shale refuses to sign, forfeiting an Elven protection army, on account of some language that was racist towards Dwarves. Before Virgo leaves, have King Shale challenge him to a tournament, a fight between the Royal Guard and Virgo's elite squad. 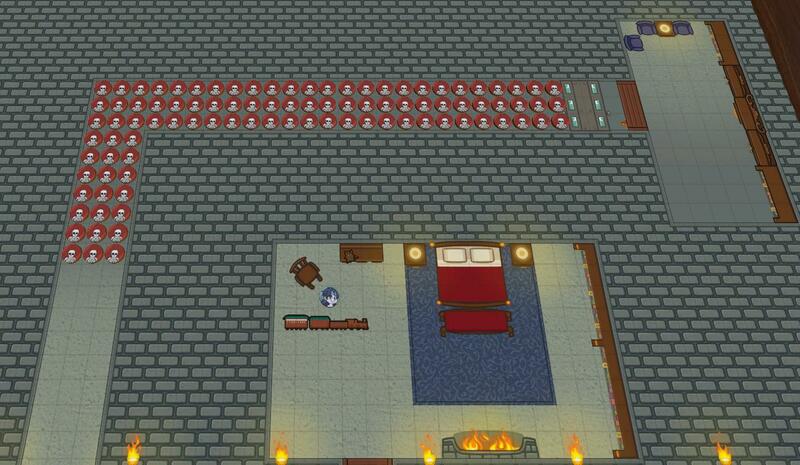 If the players have angered the King and Queen by this point, have them stay at the back of the hall, waiting for punishment on account of their failures. Have King Shale egg Virgo to send his squad to "deal with them," by killing them. 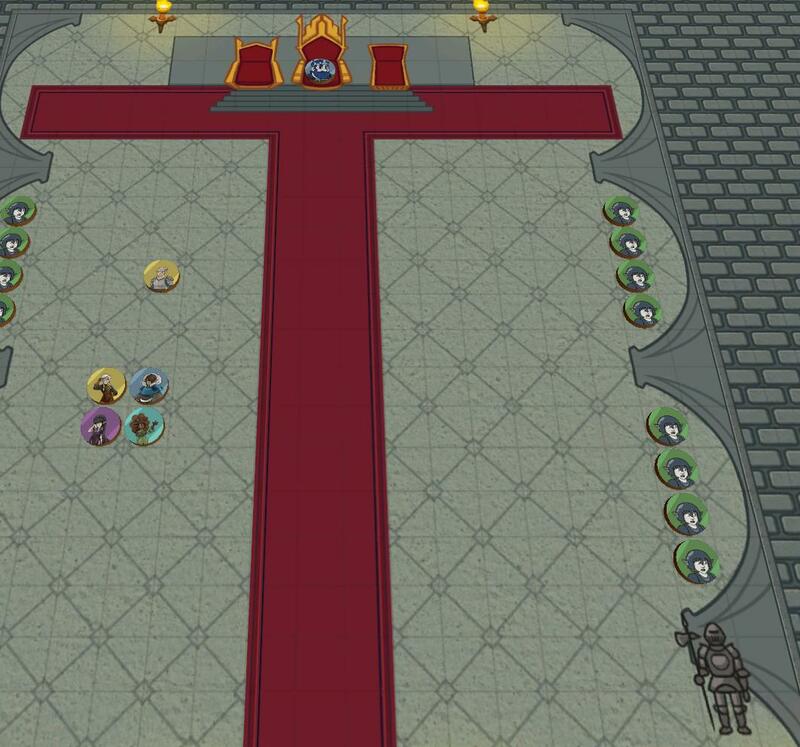 Unless the King and Queen send the squad after the players, this tournament should be challenging, but have death rolls just knock the player out of combat instead of killing them. Same for Virgo's squad. This isn't a fight to the death, just a show for fun. This fight is based around blinding the players. Cecilia and Ghana are good at blinding, while Galen and Jenathorn can capitalize off of the blindness of the players. If the party is immune to blind, consider switching all of mentions of blinding to burning or something like that. When either the players or Virgo's squad wins, say that the players hear an eerie laugh echoing throughout the halls of the castle. 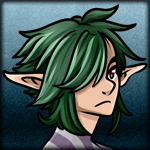 Galen is Virgo's son, and can act as either the squad's healer or another damage dealer. If it looks like the players are very strong, have him heal from the back with Purify and use Sunrise. If they are weak, send him to damage duty with the same spells, but at the front of the pack. Galen should always have the first move of the enemy team. sunrise (General go-to action. Place these by Cecilia or Ghana if they need more actions to deal damage or get out of danger. 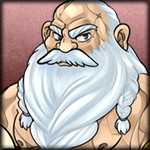 Ghana is Virgo's right-hand man, and comes to the fight well-stocked with a variety of tactics. Ghana can blind a nearby target whenever he moves, meaning you should try to have him move whenever he can. For the rest of the combat, he should focus on dishing out melee damage. 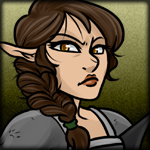 Cecilia is a protective warrior who only wants to help her team. She should be on the front lines, using her Chivalrous Pledge to help protect her team. On her turns, she should focus on basic attacking the player from afar, but try to hang back behind Galen and Ghana, making her less of a target. Jenathorn is a well-trained user of dark magic, and differs from the other members of Virgo's squad as someone who stays back and uses magic from a range. She can blind isolated targets and deal damage to already blinded targets. At this point, if the party wins, give them their legendary rolls if you have legendaries prepared or give them a treasure or one of the useless accessories. If they had angered the King and Queen, this fight may have gotten them back on the good side of the royalty - or, alternatively, killed them. Have them play as Virgo's squad if this occurs. Once this is over, say that a day passes and move on to the next encounter. 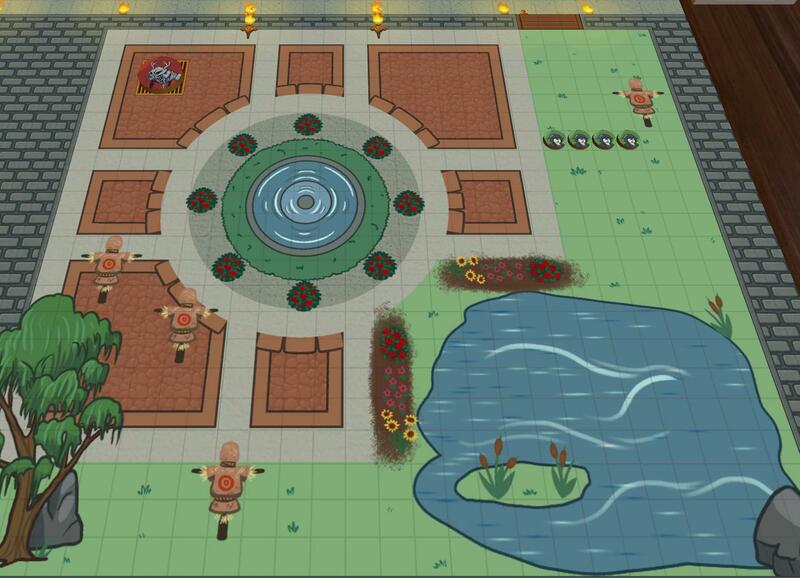 Here, the players will begin a roleplay encounter, followed by a combat encounter. Say that they arrived here at the behest of Phineas, who says that his mom wants them to train more royal guards. If they angered the King and Queen, say that they are being taken here to be punished alongside other troublemakers. Begin by having them "train" the recruits on the right. There should be one round of mock combat, in which the recruits try and fail to use charge, and the players each teach them one new move. The recruits should be incompetent in general, and make poor decisions. Once this is over with, Phineas should attempt to lead you and the recruits into battle against a Strange Skelephelk, which he will try to let out of its cage. If prevented, say that a strange purple mist seems to open the cage, releasing the Skelephelk. The Skelephelk is a difficult foe based around turning the party against each other and dealing massive damage all the while. Avoid attacking Phineas with the Skelephelk, and instead try to have Phineas attack them thanks to charm. Recruits are generally just there to give the party a harder time once the Skelephelk breaks out its charm, and will die pretty early into combat. They are just cannon fodder. If one of the players dies at any point during the campaign, have them play a slightly more robust recruit with a few more warrior abilities and more health. If the players do a good job teaching them, add the spells that the players taught them here. The Skelehelk is a dangerous foe who diverts the attention of the group to charmed party members. Every round of combat, if there isn't a charming Blanket of Darkness, make one. At this point, have Phineas beg the player characters to take him into the Gold Vault, or if the players have made the King and Queen angry, have them lock the players in the Gold Vault to die. 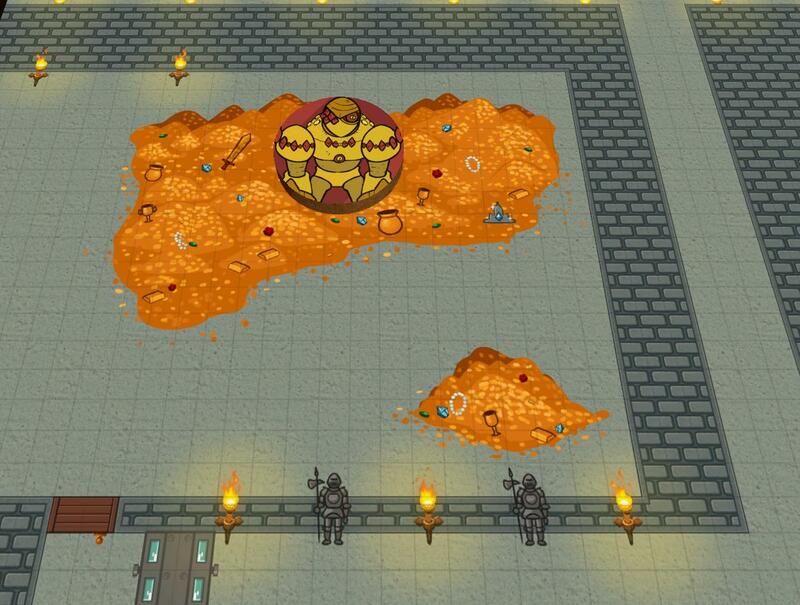 Either way, upon entering, have Phineas or the players investigate the Gold, only to have a Gold Golem rise out of the gold pile, immediately targeting Phineas. This combat isn't designed to last for long - only a few rounds of combat. It should, however, hurt the players with massive damage dealing attacks and treasure stealing abilities. The main goal is to scare the players and have them focused on protecting Phineas. Most of the attacks should be aimed at the Prince, with the players having to use anytimes to stop them. The Gold Golem has infinite stamina, and is not concerned with the players. It simply wants to keep its gold, as its gold is its life force. After four or five rounds of combat, have the Golem simply fall apart, leaving the players with echoing sounds of laughter. NOTE: there is a special cube located below this encounter in the mod. If you right click on it, under "Trigger Effects," you can play Gold Golem sound effects to your players. These sounds are just me recorded talking backwards, saying "Stop, please stop!" "I need this gold, leave me alone!" and "This is my gold. He promised me this gold. This isn't fair! Why won't you listen!?!" Play these throughout the combat. 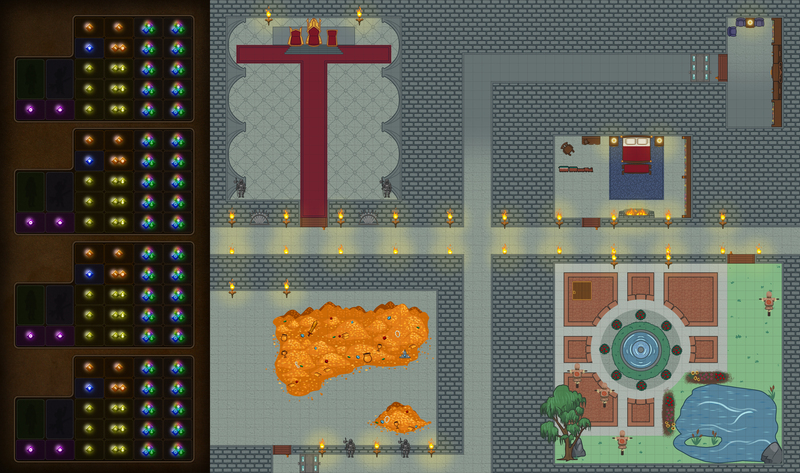 Once this combat is over, give the players a random treasure and note that the Gold pile is a lot smaller than it was when you entered. Say that a day has passed, and move on to the next encounter. Once you're finished with the last encounter, instead of saying that a day has passed, move on to this. Say that a bell has started ringing, meaning that the player characters have to get Phineas (and any other potential Royalty that have joined them on their journey) to the saferoom in the top right. Have them meet Virgo and his squad in the center, who say that the Castle is under attack from a swarm of ageless. 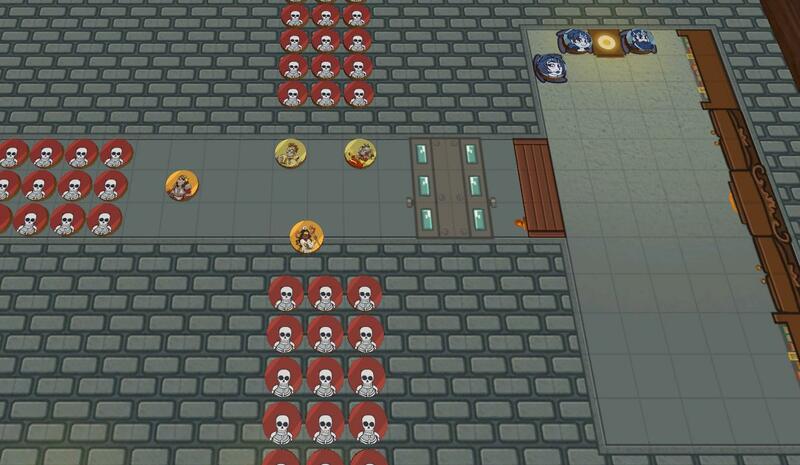 Have the squad move to the right to the front of the castle, while the players move up. Once this has gone on long enough, have Lance and his brigade of Dwarves show up, saying that they are from the Sunbeard clan, here to save the Shale family. Have them open up the door, only to find the Shale family dead and Bopen standing in their place. Have the Paladins fire arrows at Bopen, only to have them turn around midair and kill the paladins. Same should apply to anything the players try to do. Have Lance grab the remaining players and flee the castle, leaving Bopen standing there, laughing. (The Bopen, Lance, Paladins, and extra Ageless tiles are available on the table above this section). This campaign was plenty of fun for me to run and watch, and I hope it will be for you too! Credit to Rob and the Urealms team for making campaings like this possible, as well as showing all of the crazy things that can be done in Urealms! RATS? MAN I HATE RATS! Haha, I like this, this looks really cool. I'll probably run this in the future if I create a group of consistent players.